Twilight Struggle is the golden child of the board game community, having reigned at the top of the Board Game Geek’s ranking system for an extremely long time before being dethroned by Pandemic Legacy. Despite being a brilliant game, Twilight Struggle is a bit of an oddity for top choice considering its complex rules and byzantine strategy. Its complexity has left it on many board gamers’ shelves, with players waiting for the right person to come along to finally challenge them in this long, difficult game. What’s more, it takes about ten three-hour games to totally understand it. But once you do, it is a masterpiece. For all the reasons above, I have played only the digital version available via Steam. The physical board game is gorgeous, but I’ve yet to find someone to play it with. In Twilight Struggle, you play as either the USA or the USSR during the Cold War era from 1945 to 1989. This is strictly a two-player game. The objective is to score the most points by the end, be the first one to reach 20 points, or to run the DEFCON meter all the way up to DEFCON 1 (thermonuclear war) on your opponent’s turn. 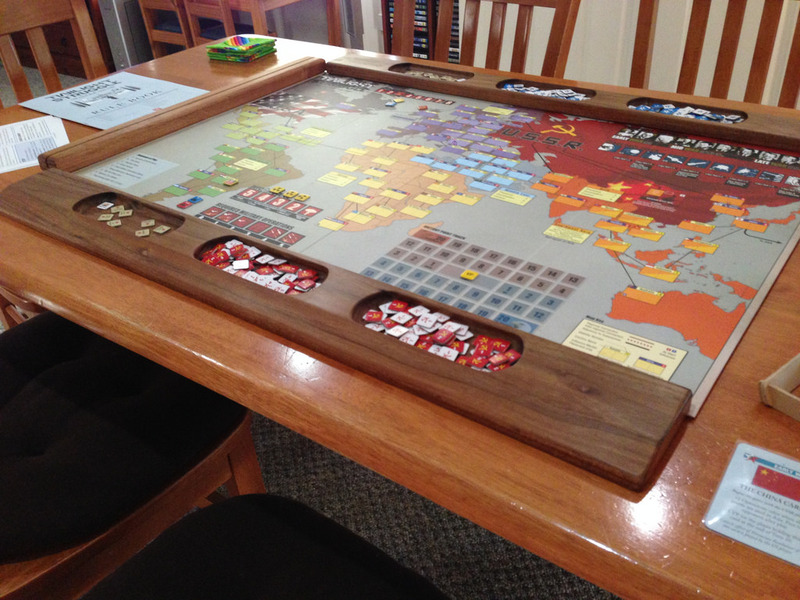 It’s played over 10 rounds, split into three eras with different cards: Early War, Mid-War, and Late War. I won’t get too much into the DEFCON meter, since that’s a whole can of worms that’s outside of the scope of this breakdown. To score, you want to have control of certain regions of the board when scoring cards come around. Broadly speaking, if you have more countries in Africa, you get points when the Africa scoring card comes around. Other scoring regions include South America, Central America, North America, the Middle East, Southeast Asia, Asia, and Europe. Instead of both players racking up separate tallies, the score rather moves along a two-ended 20 point track (40 points total) with an advantage to the USSR or USA. A little confusing? Yep. That’s my beloved Twilight Struggle. In short: control countries and get points. I’m not going to get into how the cards help you to get points until the end. What I want to instead talk about is how Twilight Struggle masterfully maintains nail-biting, white-knuckle levels of tension throughout the game. That is the true brilliance of the game. The theme immediately sets the tension. It is incredibly terrifying to imagine the two world superpowers of the bygone century spending decades on end pointing massive world-crushing weapons at each other. Russian and American fingers lingering over a red button, ready to literally destroy the world. 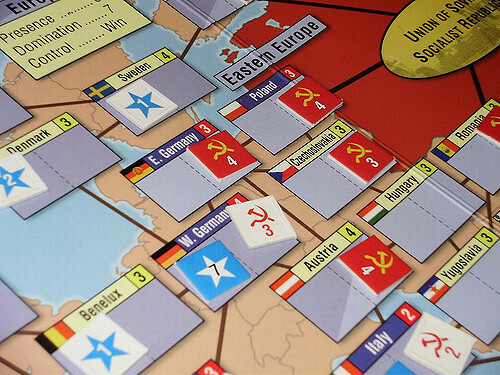 Twilight Struggle uses both historical references and gameplay mechanics to capture the feeling of fear and tension. In fact, it’s clear from the first read-through of the rules that a viable path to victory is to goad your opponent into mutually assured destruction. Yikes. Both players have opposite strategies. Without going into too much detail, conventional Twilight Struggle wisdom says the USSR tends to win the early game and the USA tends to win the late game. Imagine the paranoia that kind of asymmetry that causes. The USA is constantly on the brink of sheer chaos in the first five or six rounds, throwing buckets of water out of a sinking boat. The USSR, on the other hand, knows that they have to end the game quickly if they want a chance of winning at all. You have to maintain a foothold in multiple regions because of the scoring mechanism. There’s so many scoring cards in the game that you can’t pool your resources in one area and pray for the best. That’s a sure-fire way to lose. At the same time, there are some places that are basically hopeless to win, where you have to cut your losses and hassle the enemy like a fly. The USA has a good grip on Central and South America, but the USSR has the better located Middle East on lock. Europe tends to split right down the middle. Africa and Asia tend to be toss-ups. Now with all this in mind, imagine the sweaty nerves the American player might get as Russia claims Algeria and Venezuela. Imagine the cold chill the Russian player might feel as America takes Iraq and North Korea. There’s a lot going on at any given moment, and you can’t win all your battles. Plus, it’s not even clear which ones are worth winning. You have to make sacrifices to succeed. If you’re a designer, you owe it to yourself to play this game. It’s cheap on Steam. Give it a good five tries and expect to be terrible until you get your hours in. Study this game. It will teach you a lot about capturing the feeling of tension in your game.